" Master of Business "
William Gates, the son of a prominent Seattle, Washington lawyer, was an underachieving math whiz in school. He was first exposed to digital computers while in the seventh grade and worked on various computer projects for the next several years. While in high school, Bill and a friend, Paul Allen, formed a company called Traf-Data, which used the Intel 8008 microprocessor to help control traffic patterns in Seattle. Gates eventually sold this system to the city for $20,000 when he was only fifteen years old. He dropped out of high school for one year to work for TRW in computing, earning $30,000. In 1974 Bill was attending Harvard University when Allen spotted an advertisement for a $350 assemble-at-home computer called the Altair 8800, manufactured by MITS, a company headquartered in Albuquerque, New Mexico.Bill and Allen worked nonstop for six weeks to devise a simple version of BASIC, a programming language, for the Altair. They demonstrated their finished product to the company's engineers with great success, and the following year, Bill and Allen founded Microsoft Corporation.Microsoft had entered the personal computer (PC) industry at an opportune time.The Apple Computer Corporation had introduced its Apple II personal computer with much success. International Business Machines Corporation (IBM) decided to enter the market but needed software designed for specific tasks and an operating system that permitted hardware to interpret the software. standard and MS-DOS was its operating system. In 1995, Microsoft introduced Windows 95 which again revolutionized the PC market, and became an industry standard. Today some 90% of all personal computers use Microsoft Windows. 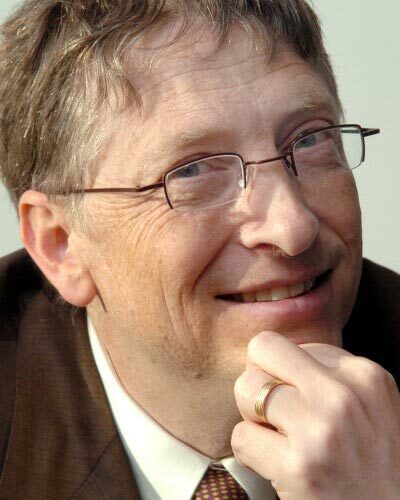 In 1991 Gates was ranked number three on the Forbes magazine list of the wealthiest Americans; his share of Microsoft is worth approximately four billion dollars.By 1998 he had became the richest man in the world. In addition to operating systems, Microsoft produces software for word processing, spreadsheets, games, and Windows, which allows IBM PCs and their clones to use pictures and a handheld "mouse" to eliminate complicated keyboard commands, much like Apple did for its computers. In 1999, Bill wrote Business @ the Speed of Thought, a book that shows how computer technology can solve business problems in fundamentally new ways. The book was published in 25 languages and is available in more than 60 countries. Business @ the Speed of Thought has received wide critical acclaim, and was listed on the best-seller lists of the New York Times, USA Today, the Wall Street Journal and Amazon.com. Gates' previous book, The Road Ahead, published in 1995, held the No. 1 spot on the New York Times' bestseller list for seven weeks. Bill has donated the proceeds of both books to non-profit organizations that support the use of technology in education and skills development. In addition to his love of computers and software, Bill founded Corbis, which is developing one of the world's largest resources of visual information - a comprehensive digital archive of art and photography from public and private collections around the globe. He is also a member of the board of directors of Berkshire Hathaway Inc., which invests in companies engaged in diverse business activities. Foundation has committed more than $3.6 billion to organizations working in global health; more than $2 billion to improve learning opportunities, including the Gates Library Initiative to bring computers, Internet Access and training to public libraries in low-income communities in the United States and Canada; more than $477 million to community projects in the Pacific Northwest; and more than $488 million to special projects and annual giving campaigns.